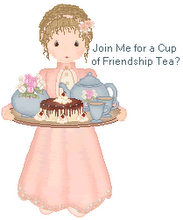 Friendship Tea: Set The Table, Tea Is On! 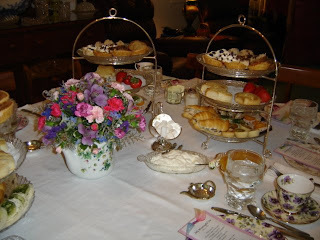 I might be able to complete this assignment before the week is over, but just to cover the bases, these photos are from an afternoon tea I hosted a couple of years ago. 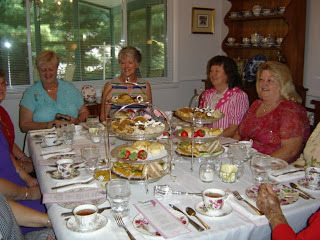 My friend Mary wanted to honor her aunts at a special event, so Mary and I hosted a tea at my home. There were 10 of us around my dining room table. 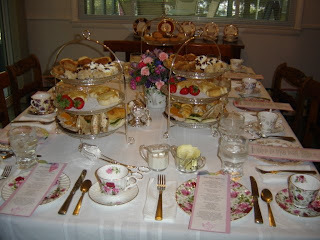 I set this table with a variety of English china teacup trios. All place settings are different, but each person's cup and saucer matches her plate. I use vintage napkins collected over the years and a variety of china teapots to serve the tea. This tea was in July so also I had a glass of ice water at each place. I use three tier servers at the tea table. I provide a printed menu at each place for the guests to keep. Favors are usually at the guest's place when they arrive at the table. They were given at the end of this tea and I forgot to take photos. That is a lovely setting. And it looks like there are lots of yummy things - I think I'll pull up a chair! What an elegant tea! I love the idea of using different settings and teapots. Lovely settings and the food looks amazing! I'd have been thrilled to have been there with such beautiful ladies and wonderful hospitality. It really is elegant! how much fun!!! It is truly lovely! 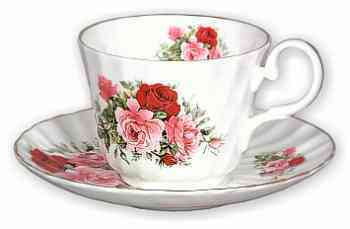 Linda, your tea table is beautiful and elegantly set. I love the way you've mixed vintage and eclectic without losing the charm of a proper table-setting. From a home economics stand-point, the teacher gets an A+!!! What a nice table setting. I love your little tea bag holders. All of the goodies look delicious! Oh that looks wonderful and has made me long for a proper English tea! I'm just curious, what did you use for your favors? I'll be hosting a Mother-Daughter Garden Tea here at my home on the 20th and would really like to have a favor for each of the 59 guests. Naturally, I won't be able to spend alot on each one. Don't you just love Miss Annabelle's? I live just up the road from there and pass there at least once a week. 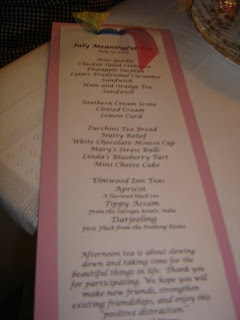 Several of her teas will be featured at my tea party! Mmmm yummy! 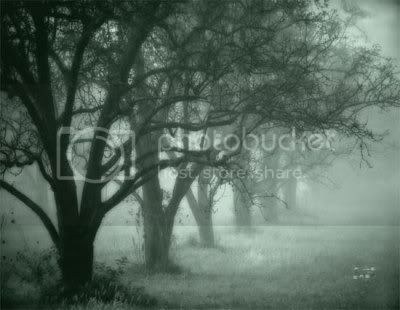 Thank you for sharing a delightful post and have a blessed weekend! How beautiful and elegant and a perfect way to honor the aunts. I love your using menus at each place. It adds an extra caring touch. I hope you don't mind if I use this idea at my next tea.